(From company literature) Kenko Teleplus Pro 300 DG converters are made with precision quality multicoated optical glass supplied by Hoya Corporation, the world's largest manufacturer of optical glass. These glass elements were designed to match the optical quality of the prime lens (even at the edges) and telephoto zoom lenses. The optical design of the elements and light path is wide enough not to cause vignetting. The DG version is optimized for use with digital SLR cameras, as well as film cameras. The PRO 300 DG family are designed specifically to be used with prime telephoto lenses of 100mm or above, such as the Tokina AT-X 300 AF PRO, 300 mm f/2.8 lens, and work best with telephoto lenses of 200mm to 500mm. 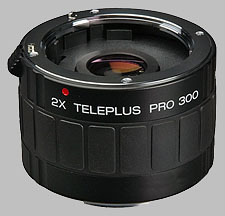 The PRO 300 DG can be used with telephoto zoom lenses as well as prime lenses. However, Kenko does not recommend them for zoom lenses that have a range starting under 50 mm. KENKO PRO 300 AF Teleplus DG converters have genuine Gate Array IC (Integrated Circuit). This means that the converter's own unique circuitry maintains signal integrity between the camera body and lens. These converters are designed to electronically operate the same way as an original manufacturer's converter. Full AF operation with PRO 300 2.0x is possible when using camera lenses with maximum aperture of f/2.8 or brighter. Please be aware that AF will work properly only if there is enough light and contrast on the subject to activate the camera's AF sensors (manual focusing is required when using lenses with smaller maximum f-stop value than those given above). I got this and the 1.4x in an attempt to extend my range on my 70-200 and expected worst because I had tried the Canon version and was disappointed. I didnt want to spend that amount on something I would be disappointed with so I opted for something cheaper. I did a fair bit of research looking at photogallery sites at samples and reviews. When I got it.. and took my first shots.. the images were better than expected. On my 70-200 IS, 5.6 was soft but this was expected. This thing magnifies the flaws of the lens 2X. However, when I stopped down two stops.. the images were pretty sharp. Bokeh wasnt was great as without but this was again expected. I reduced the stop from two to one and still found the images sharp. Moving down.. the minimum closing down that produced sharp images started at f7.1 and got better up to f11. This coincides with the MTF of this lens where the highest resolving value lies between f3.5-5.6.